Welcome to Laughing Water Ranch Laughing Water Ranch, LLC is a family owned working buffalo ranch located north of Bassett, Nebraska. Our ranch consists of 5,000 acres, but we also lease the hunting rights on many properties in the surrounding area. The ranch is bordered on the North by the Niobrara River with over 3 1/2 miles of river front and is in a segment which has been federally designated as a Wild and Scenic River. 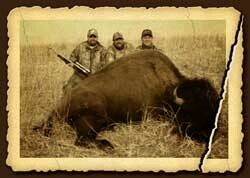 We have been raising bison since 1994 and hunting professionally since 1999. Our hunting operation is not large so we can offer flexible hunt packages with you or your group having the ranch to yourself. Our management plan is heavily weighed towards deer and turkey production to ensure a quality hunting experience regardless of season or game pursued. Great place for a DIY style turkey hunt. Lots of room on the ranch and great turkeys to hunt. They offer a real nice hunt for the price.